First the Opera then North. 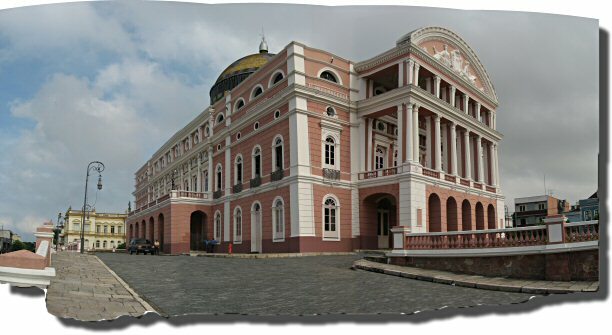 Manaus was one of the richest cities in the world and for a time it had a near monopoly on the supply of rubber (until the British took tens of thousands of rubber tree seeds to Kew Gardens). In its heyday the "rubber barons" had a magnificent opera house built (everything, except the wood, was imported from Europe). After many years of neglect the opera house has now been restored and is in use nearly every day, with most performances being free! After re-stocked the vans at the worst Carrefour supermarket I have every visited (but still the best supermarket we could find in the centre of town, at S03.133149 W 60.023816) we headed north towards Venezuela. On the way out of town we passed a much larger Carrefour at S03.078332 W60.024458. 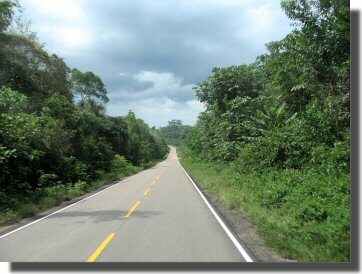 We had been told many times that the Manaus to Boa Vista road was "good". It is tarmac and in many places very good tarmac but there are many sections with pot holes, particularly in the Waimiri Atroari Reserve (where you are not allowed to stop or take photographs). We are now parked in a layby (N01.369797 W60.626630) surrounded by birds (good) and insects (bad) having crossed the equator again.